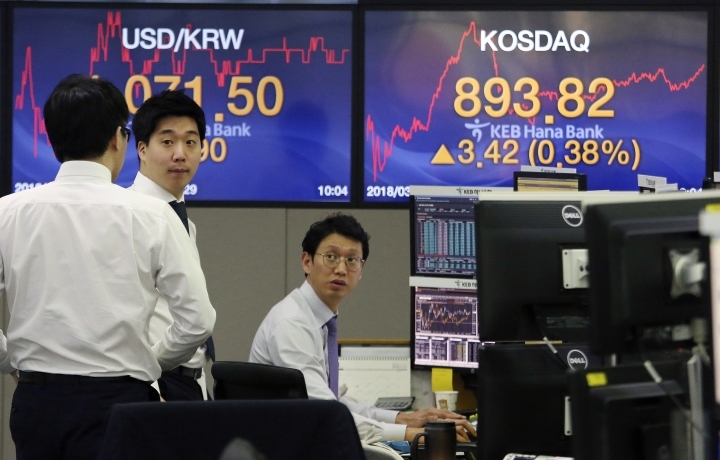 SEOUL, South Korea — World shares were mostly lower Wednesday as some markets gave back early gains ahead of the Federal Reserve's first decision on interest rates since the appointment of its new chair, Jerome Powell. KEEPING SCORE: Germany's DAX lost 0.1 percent to 12,295.13 and the CAC 40 in France declined 0.3 percent to 5,238.50. Britain's FTSE 100 fell 0.3 percent to 7,043.60. Futures for the S&P 500 lost 0.2 percent to 2,719.00. Dow futures lost 0.2 percent to 24,713.00, pointing to early losses on Wall Street. FED WATCH: Federal Reserve policymakers have begun a two-day policy meeting that is expected to result in the first of three interest rate hikes expected this year. One of the key debates on Wall Street is whether it will wind up increasing rates three times or four. Investors will be watching for Powell's comments at a press conference Wednesday afternoon. ANALYST'S TAKE: No one knows what to expect from the Fed meeting, Stephen Innes of OANDA Trading said in a commentary, "What we do know, however, is this meeting has lots of eyes on it and not just because it's Jerome Powell's first post FOMC press conference, but there's likely to be some nuanced changes in the Fed statement." FACEBOOK EFFECT: Facebook stocks dropped another 2.6 percent on Tuesday following reports that the Federal Trade Commission will open investigations on its handling of user data following the revelations that Cambridge Analytica harvested private data of its 50 million users. Its shares have fallen 9 percent this week, its worst performance in two years. Other social media companies in the U.S. also finished the day lower on concerns that the government might enact new laws affecting their businesses. In Asia, reactions were relatively muted. Tencent Holdings, which operates China's largest social media app WeChat, fell 0.9 percent before it reported that its fourth quarter net profit jumped 105 percent from a year earlier. South Korea's Naver Corp., parent of Line messenger app, dropped 0.1 percent. 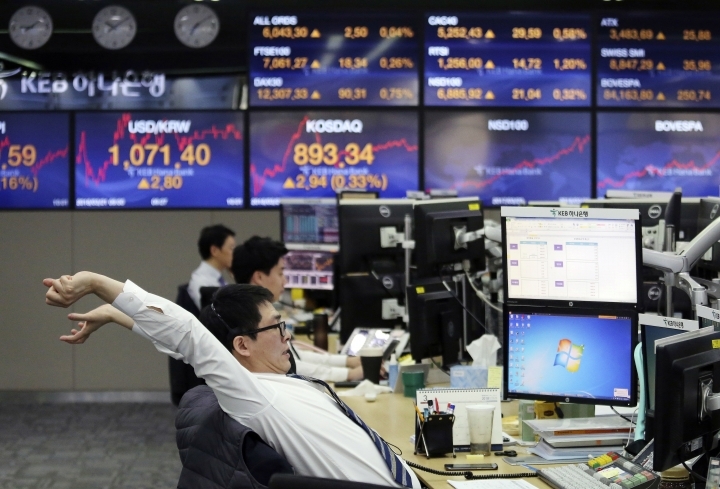 ASIA'S DAY: Hong Kong's Hang Seng index erased earlier gains to fall 0.4 percent to 31,414.52 after rising more than 1 percent earlier in the day. 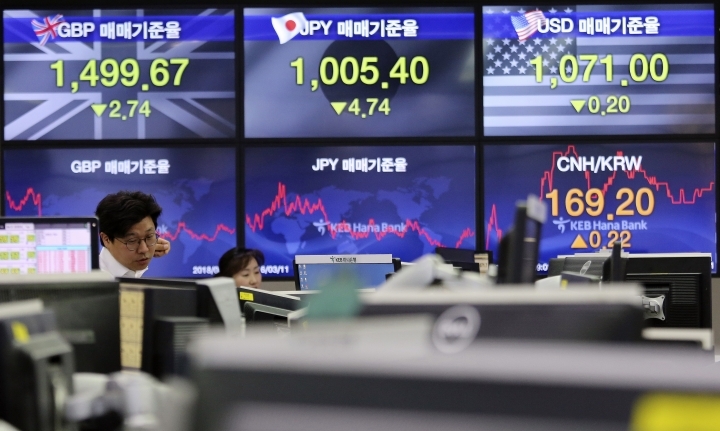 China's Shanghai Composite Index fell 0.3 percent to 3,280.95 and South Korea's Kospi was flat at 2,484.97. Australia's S&P/ASX 200 advanced 0.2 percent to 5,950.30. India's Sensex rose 0.4 percent to 33,111.19. Stocks in Taiwan were flat but markets in Southeast Asia were mostly higher. Japan was closed for a holiday. OIL: Benchmark U.S. crude rose 26 cents to $63.80 per barrel in electronic trading on the New York Mercantile Exchange. On Tuesday, it finished at $63.54 per barrel, up $1.42 from the previous session. Brent crude, used to price international oils, added 28 cents to $67.71 per barrel. It gained $1.37, or 2.1 percent, to finish at $67.42 per barrel on Tuesday. CURRENCIES: The dollar fell to 106.29 yen from 106.53 yen. The euro gained to $1.2278 from $1.2241.